The former senator and presidential candiate offers a provocative new assessment of the first "National Security President." James Monroe is remembered today primarily for two things: for being the last of the "Virginia Dynasty" -- following George Washington, Thomas Jefferson, and James Madison -- and for issuing the Monroe Doctrine, his statement of principles in 1823 that the Western Hemisphere was to be considered closed to European intervention. But Gary Hart sees Monroe as a president ahead of his time, whose priorities and accomplishments in establishing America's "national security" have a great deal in common with chief executives of our own time. Unlike his predecessors Jefferson and Madison, Monroe was at his core a military man. He joined the Continental Army at the age of seventeen and served with distinction in many pivotal battles. (He is prominently featured at Washington's side in the iconic painting Washington Crossing the Delaware.) And throughout his career as a senator, governor, ambassador, secretary of state, secretary of war, and president, he never lost sight of the fact that without secure borders and friendly relations with neighbors, the American people could never be truly safe in their independence. As president he embarked on an ambitious series of treaties, annexations and military confrontations that would secure America's homeland against foreign attack for nearly two hundred years. Hart details the accomplishments and priorities of this forward-looking president whose security concerns clearly echo those we face in our time. 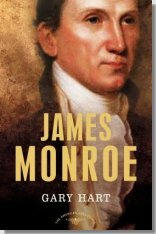 James Monroe is available at all fine bookstores.